Get a leg up when you need it with the UPLIFT Desk Replacement Leg. If you need a replacement for any of the components parts for any two or three leg UPLIFT Desk Standing Height Adjustable Desk, you can order a new one. Desk legs come in black, white, or gray. Note that if you are adding a third leg to a two leg desk, you will need to purchase the UPLIFT 2-Leg to 3-Leg Conversion Kit. I'm converting my desk into a 3-leg corner workstation. Will this work? 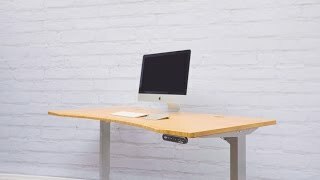 If you're adding a third leg to a two leg desk, you'll need to purchase the UPLIFT 2-Leg to 3-Leg Conversion Kit to complete your desk overhaul. Why do I need a new desk leg? If your desk leg breaks, you'll definitely need a new one. That is why we offer solo desk leg replacements. Install the new desk extremity and get back to standing! You'll be able to select your replacement leg in the color that matches your UPLIFT Desk frame - black, white, or gray.